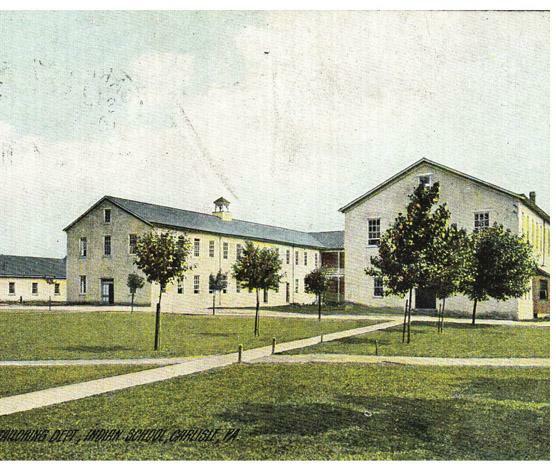 A mere few miles from Dickinson, the Carlisle Indian Industrial School (CIIS) was founded in 1879 to “civilize” American Indian children by teaching them to assimilate into American society. Over the course of 39 years, the school took in approximately 10,000 children from 140 tribes — many of them forcefully. Image courtesy of the Carlisle Indian School Digital Resource Center. Of those who attended, many entered careers as teachers, tradesmen and athletes — including Frank Mount Pleasant, Dickinson class of 1910, who competed in the 1908 summer Olympics in London. Others, cut off from their native languages, identities and families of origin, entered a legacy of trauma and disenfranchisement. All of them have stories to tell, and now, more than 130 years later, their descendants, as well as researchers and archivists, have unprecedented access to those stories. One of those descendants is Rene Garcia, who learned about her grandfather, Peter White, and other Mohawk ancestors who attended the CIIS, through the Carlisle Indian School Digital Resource Center, a Dickinson-hosted Web site dedicated to posting all available records of the children who attended the school between 1879 and 1918. The Dickinson team members behind this ambitious project include Susan Rose ’77, professor of sociology and director of the Community Studies Center; James Gerencser ’93, college archivist; Malinda Triller Doran, special collections librarian; and a multitude of students and recent alumni who have traveled to the National Archives and Records Administration (NARA) in Washington, D.C., to scan more than 4,400 CIIS student files so far, totaling about 60,000 pages of records — two-thirds of the total amount on file. Barbara Landis, historian at the Cumberland County Historical Society, as well other local CIIS experts, is lending her expertise. The project is funded by Dickinson’s Research & Development Committee and the Andrew W. Mellon Foundation Digital Humanities grant, which supports the researchers’ travel to D.C. to scan and digitize the records. Gerencser says that they also plan to build partnerships with other institutions that may have photos, letters or other items connected to the school as well as with descendants of the CIIS students and other researchers. So far, more than a few viewers have come forward with photos and other mementos. “It was exciting to see the student records online that I wouldn’t have access to unless I wrote to NARA,” says Garcia, adding that she learned of the site through the CIIS Descendants, Relatives and Friends Facebook page. Cheyenne Chief (Manenmic) one of Florida prisoners. Image courtesy of the Carlisle Indian School Digital Resource Center. Dickinson faculty and students also have been taking advantage of the different materials available on the site, which has separate pages for student files, images, publications, collections and Web sites. Alan Shane Dillingham, visiting assistant professor of history, used the site in his course Native Histories of the Americas, in which students learn about the lives of individual CIIS students and present their research to their classmates. “It’s been a really exciting experience,” Dillingham says, explaining that the course is organized around certain themes, one of which was how the tribes shifted from isolation to a type of inclusion, integration and, to a certain extent, assimilation. Dillingham brought in Landis to provide some context to the CIIS story, and he ensured that there was a good variety of choices in terms of geography, gender and other categories for his students. One of Dillingham’s students, Mackenze Burkhart ’15, a double major in archaeology and anthropology, researched the life of a remarkable Carlisle student, James M. Phillips (Cherokee). “What I found to be significant about Phillips is that unlike the majority of narratives we read in class, Phillips’ story is one of success and happiness,” she says. “Phillips entered the school in 1901, but only to participate in athletics, as he was an extremely talented football player,” Burkhart explains. Those connections will grow as the research and digitization team continues its work. Read more from the summer 2014 issue of Dickinson Magazine.